The European Central Bank unveiled yesterday (10 January) a new 5-euro note, with warmed colours and better protection against counterfeiting. For the first time, it also carries the name ‘Euro’ written in the Cyrillic alphabet, and displays a portrait of Europa, a figure from Greek mythology. Mario Draghi, President of the European Central Bank (ECB), unveiled the ‘Europa series’ €5 banknote, with his signature featured under the EU flag. It will be issued, on 2 May 2013. The presentation was the highlight of the opening of a “New Face of the Euro” exhibition, at the Archaeological Museum in Frankfurt am Main from 11 January to 10 March 2013. 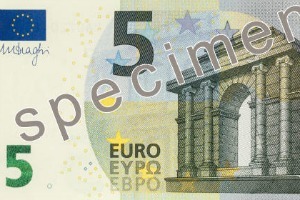 The new €5 banknote benefits from some new and enhanced security features. The watermark and hologram display a portrait of Europa, a figure from Greek mythology – and hence the name of this series of banknotes. An eye-catching “emerald number” changes colour from emerald green to deep blue, and displays a vertically moving light effect. Short raised lines on the left and right edges of the banknote make it easier to identify the banknote, especially for visually impaired people. Most importantly, the new note features for the first time the word 'Euro' in Cyrillic: ??? ?, along with the Greek Ευρ?. Since Bulgaria, the only EU country using the Cyrillic alphabet, is not yet a member of the eurozone, this could be seen as a political signal of the ECB’s trust in the future enlargement of the European single currency area. Two candidate countries, Macedonia and Serbia, also use the Cyrillic alphabet. The name ‘Cyrillic alphabet’ honours the younger of the Cyril and Methodius brothers, born in Thessaloniki at the beginning of the 9th Century, who created the Glagolitic and then the Cyrillic alphabets with the aim to have the Bible and other texts translated into Slavic languages [more]. The new banknotes of the ‘Europa’ series with denominations of €10, €20, €50, €100, €200 and €500, will be introduced over the next few years, in ascending order. Their “ages and styles” design and dominant colours will be the same as the first series. Gradually, the first series will be withdrawn and eventually cease to be legal tender – with advance warning. But first series' banknotes will retain their value indefinitely and be exchangeable at euro-area national central banks at any time. In 862, Prince Rastislav of Great Moravia requested that the Byzantine Emperor Michael III and the Patriarch Photius of Constantinople send missionaries to evangelise his Slavic subjects. Cyril and Methodius were sent, having designed for the purpose the Glagolic alphabet, the first to be used in Slavonic manuscripts. In 863 Cyril and Methodius began translating the bible in Old Church Slavonik and travelled to Great Moravia to promote it. Later, Cyril and Methodius developed the Cyrillic alphabet, as a political project of Bulgarian king Boris, whose reign from 852 to 889 was marked by the Christianisation of Bulgarians. The watermark and hologram of the new design display a portrait of Europa, a figure from Greek mythology – and hence the name of this series of banknotes. Is this the first sign of a sense of humour from Brussels – or is it a thinly-disguised hint of the future outcome of the Project? This honours in a sense the presence of orthodox Slavs in the EU who are I think the only Slav groups who use the cyrillic alphabet created by the 2 Greek monks. EURACTIV Turkey: ??? ???????????? ??? «5 ??? ?» ?? ???????? ??????? ?